External analgesic used to treat fractures and dislocated joints due to sports or other traumatic injuries. This is the liniment of choice for bone fracture. Cause, cotton balls or cloth is soaked in the liquid, and applied directly to the fracture for thirty minutes up to two hours. As a trauma liniment, it is applicable for other acute injuries marked by swelling or pain. External analgesic used to treat fractures and dislocated joints due to sports or other traumatic injuries. This is the liniment of choice for bone fracture. Cause, cotton balls or cloth is soaked in the liquid, and applied directly to the fracture for thirty minutes up to two hours. As a trauma liniment, it is applicable for other acute injuries marked by swelling or pain. Also useful as massage liniment before or after exercise. Can be added to bath water. 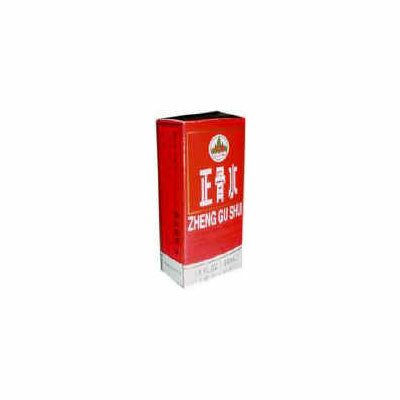 Promote blood circulation, decrease swelling, promote regeneration of broken bone tissue, promote healing of fractures. Invigorates blood, breaks blood stasis, moves Qi, stops bleeding, strengthens tendon and bone, dredges and opens the channels and collaterals, relieves pain. Simple backache, arthritis, strains, bruises, sprains, muscle pain, fractures, swelling. Use to heal bone fracture, and for inflammation and swelling during manual bone setting. Also useful for acute bruising or swelling accompyanying traumatic sprain. May be helpful in torn or inflamed ligaments, with or without swelling. Analgesic for pains of muscles, joints, bruises, and strains. Adults and Children 2 years of age and older, clean the affected area before application. Apply to the affected area not more than 3 to 4 times a day. Apply to the affected area before the bone is set in a hospital setting, this will stop the pain. After the bone is set, apply a cotton ball soaked with the solution to the affected area. 2 or 3 soaked cotton balls may be used to “surround” the fractured area. Lightly wrap the soaked cotton balls into place with gauze. Leave the soaked cotton balls on the area for 1 and 1/2 hour if the fracture is on a lower limb.